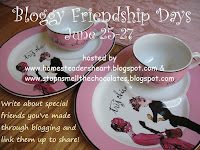 It's still Bloggy Friendship Days here and at Homesteader's Heart! 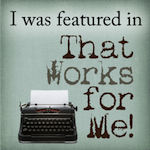 I enjoyed telling you about some of my bloggy friends yesterday! When you stop over at Kim's, she's got Friday Funnies with a friendship twist. And I am happy to celebrate my usual Chocolate Friday, BUT this one is a battle. 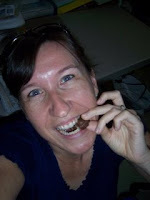 The battle of the chocolates between me and my bloggy friend Kim. See who you think is the winner - OK, we're all winners 'cause it's all chocolate and chocolate is goooood! 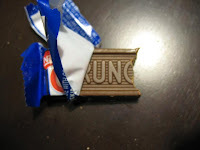 For example, Kim has written a post entirely devoted to chocolate. But I wrote a post about chocolate that included a poem! You want more examples? Hey I drink chocolate tea! Oh yeah? 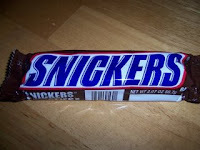 Well I like candy bars, too! 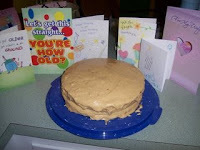 Kim likes chocolate cake with peanut butter frosting. Well I like chocolate cake with a chocolate glaze. 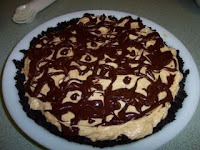 Kim likes peanut butter and chocolate combined in a pie. 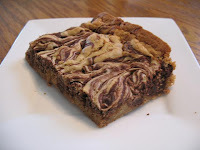 I like peanut butter and chocolate combined in cookie bars. 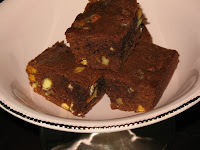 Kim like brownies with extra stuff in them. 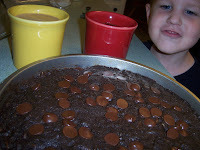 I like brownies with extra stuff in them, too - so there! Kim takes pictures of herself eating chocolate. Hey, give me that chocolate - that's mine! There were many more similarities, but without pics. It's a little scary, isn't it? Whew - a chocolate battle is tiring. I might need some chocolate to recover! OK Kim, I'll match any chocolate recipe you got - Oh YEAH!! By the way, trash talkin' makes Kim extremely competitive so there will probably be some great chocolate posts coming up on her blog soon! You're welcome - LOL! 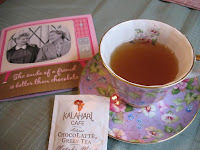 I happen to think that friendship and chocolate are essential ingredients of A Beautiful Life, so I'm linking this up at The Inspired Room today! Stop by there to see how others are making life more beautiful. 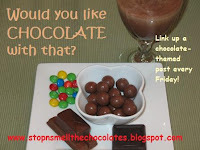 Now you link up some chocolate posts! I promise - I'll love them and won't even give you any trash talk! 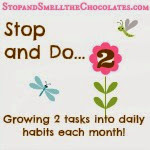 Link up your old or new chocolate posts with Mr. Linky below! 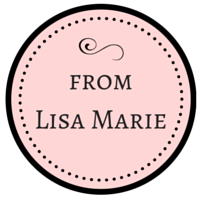 Don't forget to be writing your Bloggy Friendship posts (I've seen some around already! ), but don't link them up yet - that's for tomorrow. And remember, when you link those up tomorrow - you need to link them up here AND at Homesteader's Heart! It's our friendship linky love to you! Oh this was too funny my friend. I love the pics of us at the end there. Yup, the cats out of the bag! Oh and you want chocolate? I'll give you chocolate! It's so on! LOL. Yeah, you know me alright!!! Big my chocolate is bigger than your chocolate size hugs to you! Just know that I love you. REALLY! Happy Friday! 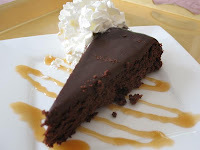 Thought you'd like to know that today is national Chocolate Pudding Day! Hope you have a great weekend! I posted my link and now I have to get ready for the last day of VBS! Thank goodness! Well I WAS enjoying my broccoli...but now I think I need to go and grab some chocolate!! Oh my my those look so gooooooooooood! I love chocolate! I am now a follower of your blog. A match made in Heaven for sure! way too yummy! Now I need to find some chocolate! Well, I will match you in your love for chocolate! 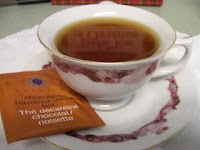 However, I've never heard of chocolate tea, but I don't like tea anyway so you're safe!